Building on Albert Munsell's crystallization of the framework of hue, value (or lightness) and chroma, the science of colour appearance has developed a lucid systematics of perceived colour that includes in addition the attributes of brightness, colourfulness, saturation and brilliance (along with its inverse, blackness). Unfortunately, these later developments remain poorly understood by nonspecialists, and are hardly known among painters, who could benefit greatly from applying them as a framework for solving colour problems. 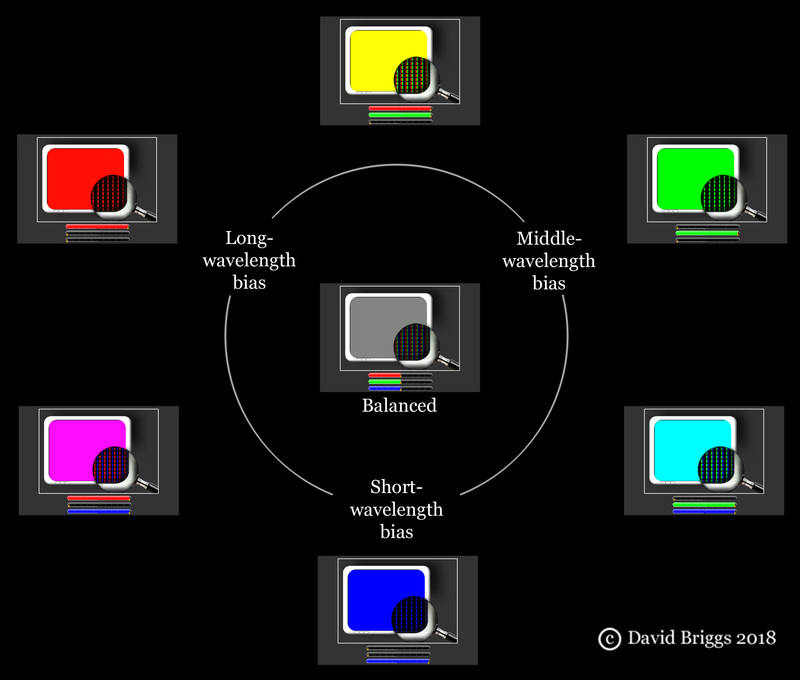 This webinar will use slides and animations from David’s teaching materials to show how these seven attributes can be explained in ways that are intelligible to students, and how each attribute can be presented as a way of perceiving a particular property of lights or objects, instead of resorting to explanations invoking coloured wavelengths and receptors that “detect colours”, which only serve to undermine understanding of the fundamental nature of colour. 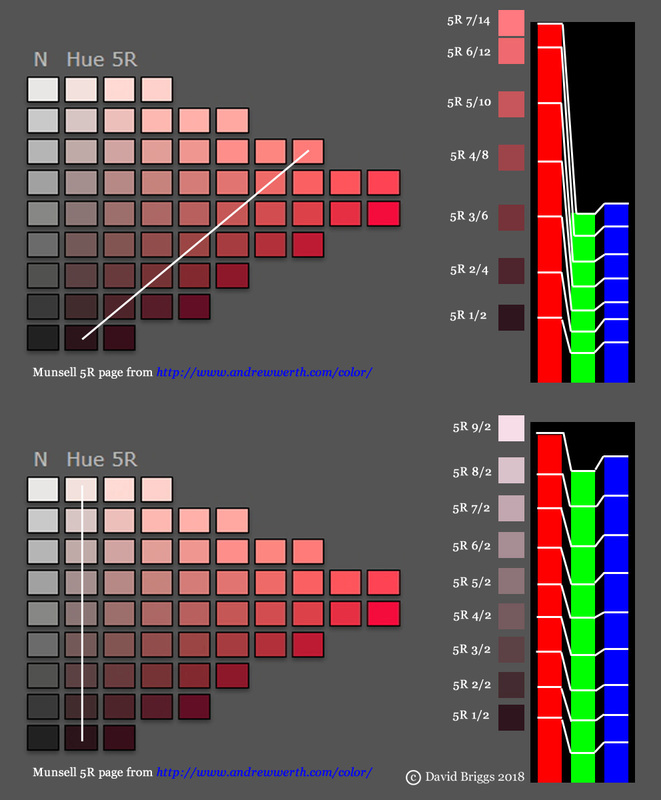 Contours of equal NCS blackness (under the viewing conditions specified for the NCS) on the 5PB and 5Y pages of the Munsell Book of Color glossy edition. 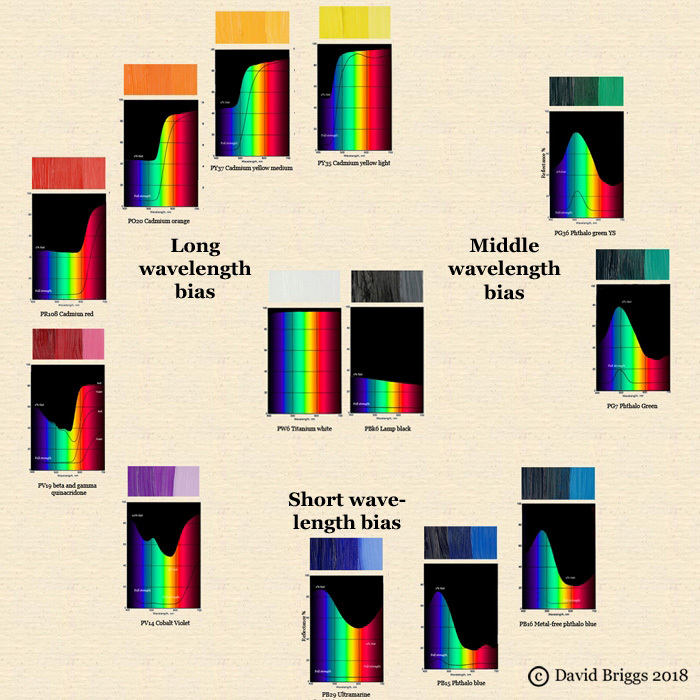 The saturation of a digital colour is the way in which we perceive the relative or proportional imbalance of its long-, middle- and short-wavelength components, while its chroma is the way in which we perceive the absolute imbalance of those components (shown in nonlinear RGB units). 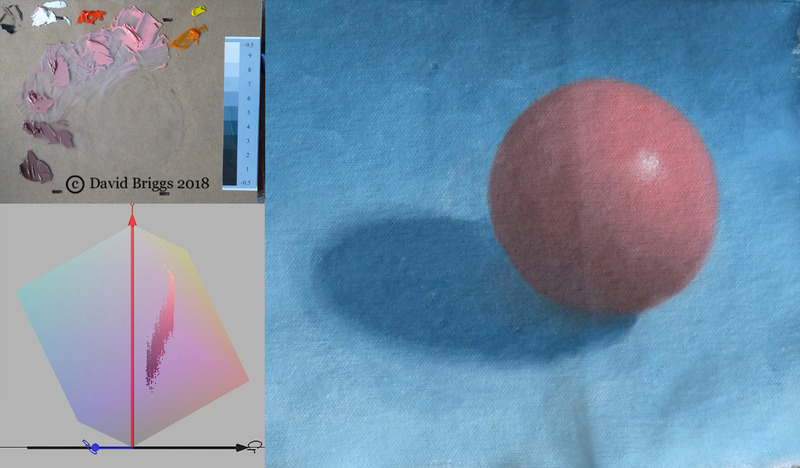 The hue of an object is the way in which we perceive a direction of imbalance or bias among the long-, middle- and short-wavelength components of its spectral reflectance. 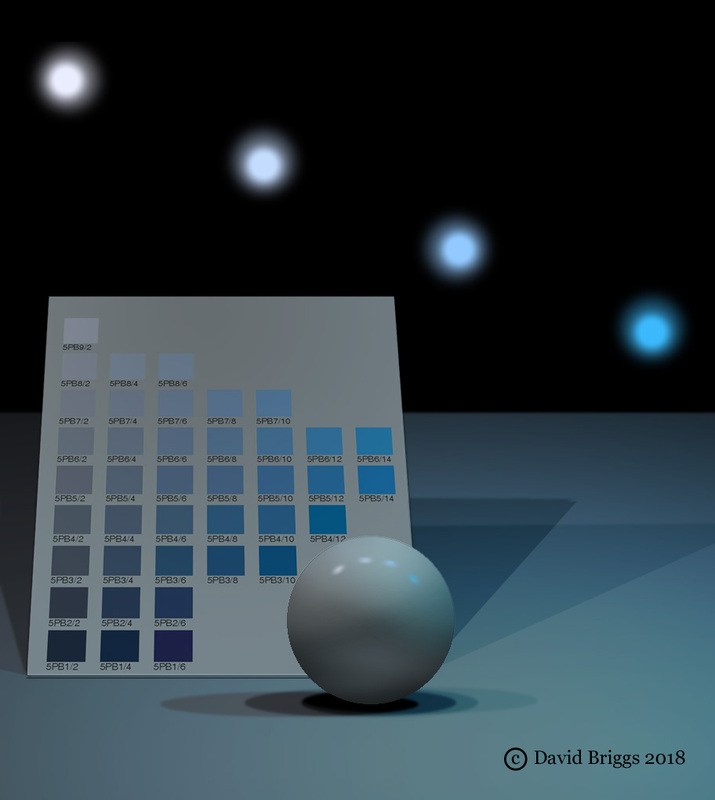 Objects perceived as luminous are generally much brighter than a white object in the same location, and so exhibit brightness but not lightness (position on a scale from black to white). Workshop student's shading series on palette, photographed and displayed in YCbCr space, and applied to painting a sphere. The hue of a digital colour or an isolated light is the way in which we perceive a direction of imbalance or bias among the long-, middle- and short-wavelength components of its spectral power distribution, relative to daylight. David Briggs is a painter and teacher at the Julian Ashton Art School and the National Art School in Sydney, Australia. He has been teaching classes on colour for painters for nearly twenty years, including a long-running intensive five-day workshop, Colour, Light and Vision, and an undergraduate lecture course on the history of artistic colour theory and practice, Theories of Colour. 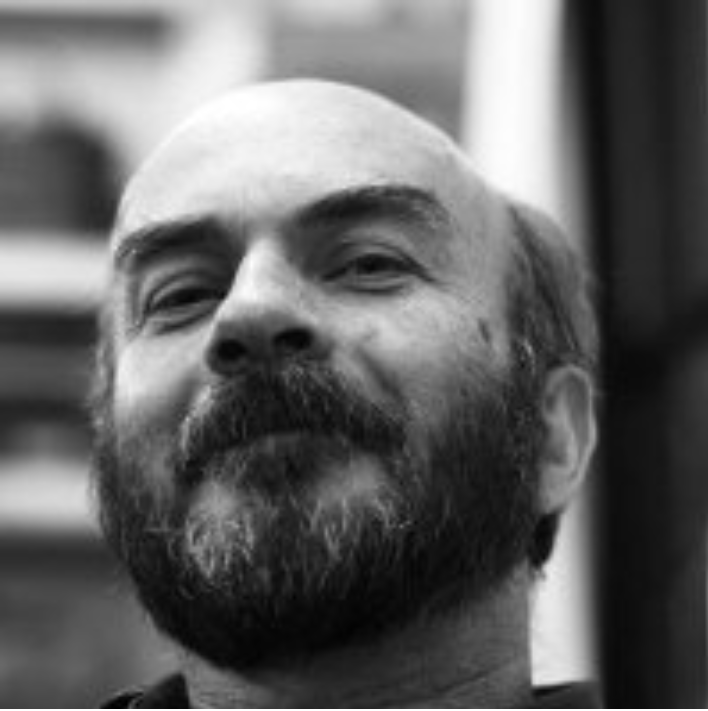 David is the Chairperson of the New South Wales Division of the Colour Society of Australia and has contributed to publications including a chapter on colour spaces in the forthcoming Routledge Handbook of Philosophy of Colour. 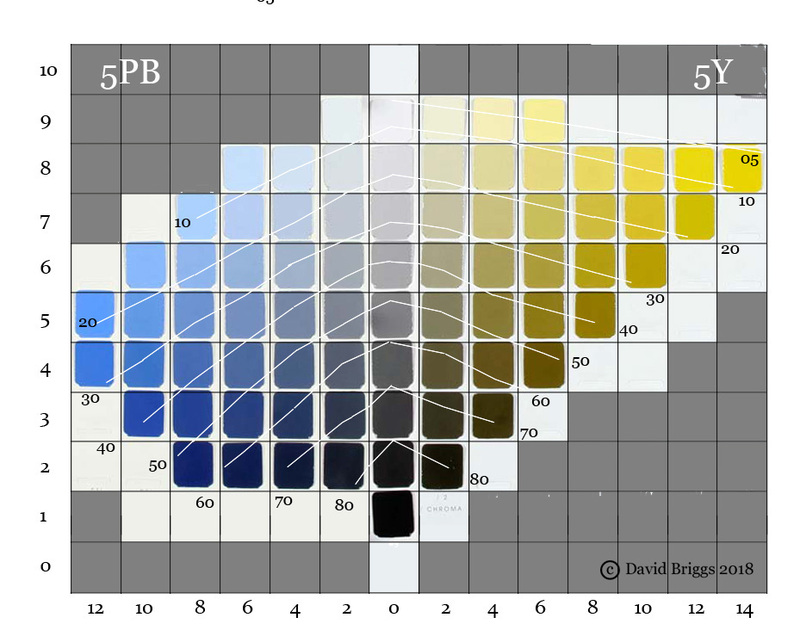 Some of his efforts to present current scientific understanding of colour in ways that are accessible and useful to painters can be seen on his website The Dimensions of Colour: http://www.huevaluechroma.com/.